We offer anti-aging treatments such as Chemical Peels, Botox Cosmetic, Injectible Fillers and laser treatments to reduce wrinkles, sun spots and redness. We offer treatments for the body including Spider Vein Removal and Laser Hair Removal. We are also proud to be the first in the area to offer CoolSculpting, the revolutionary non-surgical contouring treatment that freezes stubborn fat, which is then naturally eliminated from your body. Botox Cosmetic is a prescription medicine that is injected into muscles and used to improve the look of lines and wrinkles. It has been used successfully and without any long term negative effects since the 1990s. Botox has been proven to be safe and effective in removing the dynamic wrinkles that result from repeated expressions, but it is not a permanent solution and follow-up visits about three to six months apart are needed to keep the wrinkles from reappearing. Our skin changes as we age. 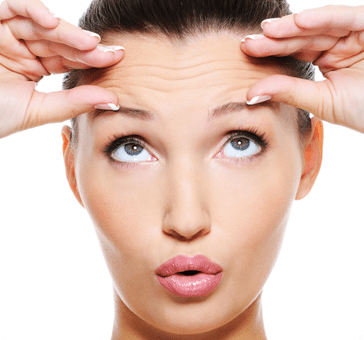 Over time, the natural volume of youthful skin begins to diminish as wrinkles and folds form. FDA-approved Juvederm injectable gel is a dermal filler that instantly restores your skin’s volume and smoothes away facial wrinkles and folds. Confidence starts with great looking skin. With the advanced laser technology of our GentleMax system, there’s never been a better time to gently and safely remove unwanted hair and age spots. It also removes leg as well as facial veins. The Candela GentleMAX takes hair removal technology to the next level, by combining the capabilities of two of Candela’s top laser systems, the long pulse GentleYAG laser and the GentleLASE alexandrite laser system. With the combined power of these two laser systems, the Candela GentleMAX effectively removes facial hair and body hair for all skin types and most hair types. The broad spectrum of the GentleMAX’s multiple wavelength laser technology provides different laser intensities, which is how the GentleMAX can treat everything from facial veins to unwanted leg hair. CoolSculpting® is a revolutionary non-surgical contouring treatment that freezes stubborn fat, which then is naturally eliminated from your body. No needles, no special diets, no supplements, no surgery and most importantly, no downtime. Unlike most other methods of fat reduction, CoolSculpting involves no needles, surgery or downtime. Patients often spend procedure time reading, working on their laptops or simply relaxing. All of our skincare services begin with a skin consultation to determine your individual needs. We will develop a skin care plan designed just for you. Extractions will be performed as necessary and chemical peels may be added to any facial or microdermabrasion. A chemical peel has an array of strengths, from light exfoliation to medium depth to deep exfoliation. The number of layers applied and strength used determines the amount of exfoliation that takes place. You may experience light sloughing to more of a “peel.” Your aesthetician will determine which peel is best for you. Call us to schedule a consultation to find out if CoolSculpting is right for you.